Growing up in Southern California, David was continually involved in the visual arts. 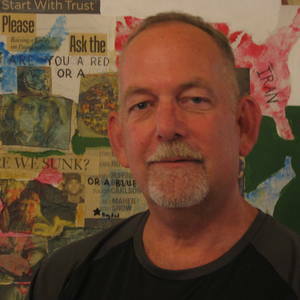 David developed his artistic painting and drawing disciplines under local artists, Steve Fountain and Jim Monroe. He studied pottery and textiles with Dixie Olsen. While at Mount San Antonio College, Walter Mix and Dorothy Merk challenged David in two dimensional design and exploring the human form. Art Historians Richard Reynard and Martha Villegas expose him to Modern and Contemporary approaches. Despite spending his childhood in the Los Angeles area, he was not aware of the Pop and Op Art movement taking place in his own backyard. David studied in Paris, France and explored Malaga, Spain in 2006. This happened to be the year Picasso would have turned 100. On of his favorite cultural events is Nuit Blanche. The Parisian "White Night." Everyone should experience this celebration of culture til over night exhaustion hits. In 2013 David studied once more in Paris. Paying personal homage to Claude Monet not only in the Orangerie, with a side trip to Giverney. Breathing in the moist air of the living art work Claude Monet gave to the world in his gardens. Then traveling to the south of France. Inhaling the haunts of Van Gogh, Renior, Cezanne, and Matisse. Color dives my personal passion. A huge student of Mark Rothko, his free expression of color excites me. My new passions are for the darks and grays. Being divided in purpose, the lack of color expresses my concern of deconstructing people. Retiring appears to be dismantling the individual.